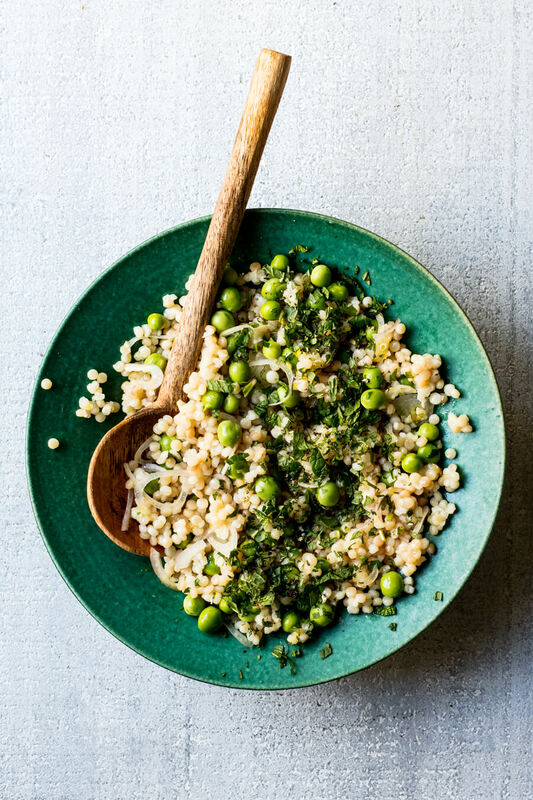 Sweet green peas, pearl couscous, and lots of flavorful herbs make a crowd-pleasing spring salad. Lots of little orbs bounce around in this salad that gets a triple dose of “lemon” from zest, juice, and lemongrass. If you haven’t worked with it before, lemongrass can be tricky when used this way. And by tricky, I mean chewy, woody, and distracting if not fully minced. So be sure to really pound or smash it and only then start mincing it. And once you start mincing it, don’t stop until it is well and truly minced. No chopped. No chopped finely. In terms of pounding it, I use a meat pounder, but the bottom of a small frying pan works quite well, too. If you’re strong and have a big knife, the side of the blade made just do the job—lay the blade over the stalk and push down with the palm of your hand. I’m not strong enough to make that work, but I’ve seen it in action to decent effect. The feta is optional, but something about the creamy saltiness of it brings everything together in a magical way. In a medium saucepan, heat 1 tablespoon of the oil over medium-high heat. Add the couscous and cook, stirring, until it starts to toast with a few of the pieces starting to brown, about 3 minutes. Add the broth or salted water, bring to a boil, cover, and reduce the heat to low. Cook, undisturbed, until the liquid is mostly absorbed, 10 minutes. 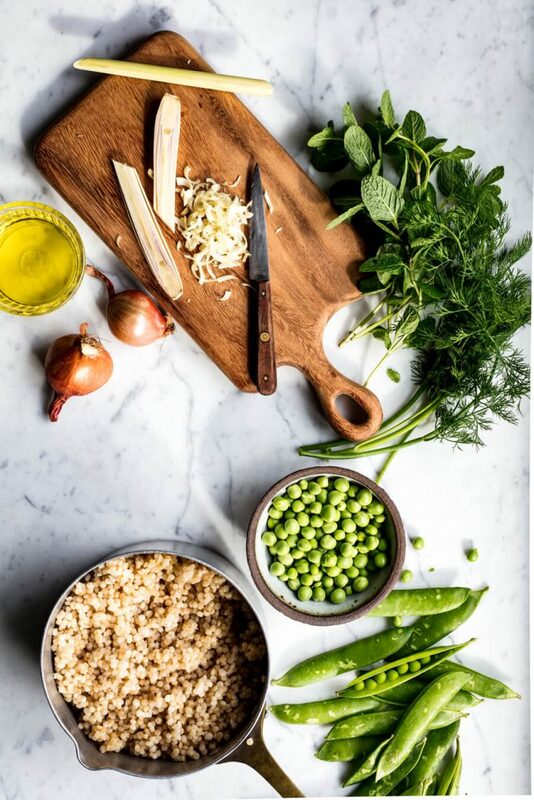 Remove from the heat, uncover, and fluff the couscous and break it up as you transfer it to a large bowl or sheet pan to cool until no longer steaming, about 5 minutes. While the couscous cooks, make the dressing. Trim and mince the lemongrass. This is a tough, fibrous plant, so you need to pound or smash it first (I use a meat pounder) and then mince it as finely as possible to get the flavor of it without any tough pieces in the final salad. Put it in a salad bowl. Peel the shallots, halve and thinly slice them; add them to the bowl. Zest the lemon into the bowl, using a microplane if you have one or a fine grater or zester. Be sure to only grate off the bright yellow zest and leave the bitter white pith behind. Cut the lemon in half and juice it into the bowl. Add the salt and pepper, then stir in the remaining 3 tablespoons of olive oil. When the couscous is cooled off, add it to the dressing and toss to coat. 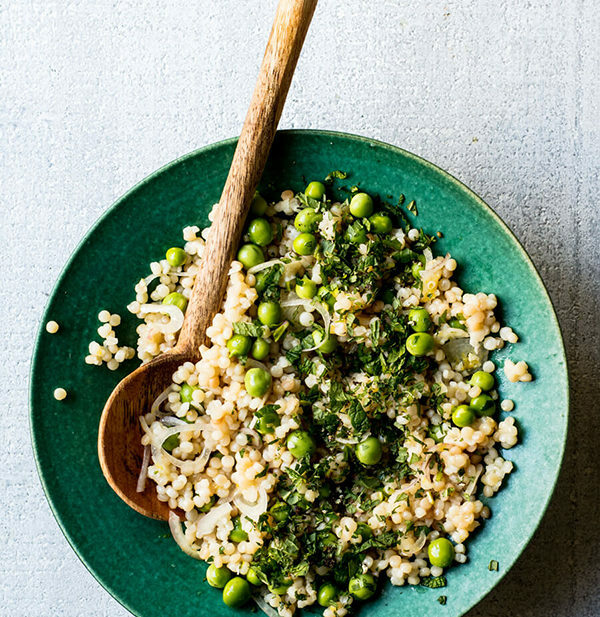 You can add the peas raw, or quickly cook them in boiling salted water for 2 minutes, drain, and cool off as quickly as possible by rinsing under cold water. Pat dry and add to the salad. Finely chop the dill and mint leaves and add them to the salad (you can reserve a few leaves to garnish the salad with, if you like). Serve slightly warm or at room temperature, with crumbled feta on top, if you like. In the unlikely event you have leftovers, know that all the green will fade a bit after a night or two covered and chilled, but the flavors will blend beautifully and you may find you like it even better.